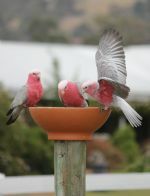 Sometimes a whole flock of rosellas land on the fountain for a drink and quick bath - just lovely! Looking out over the kennels - from the roof of the office! The kennels are in one long row facing north to obtain maximum sunlight.